Joeng Hye SSN (Zen Master Andrzej Piotrowski) had his first contact with Zen practice as a member of a theater group which organized a series of workshops on human spirituality with teachers from various traditions. A few years later he became a student of Zen Master Seung Sahn. 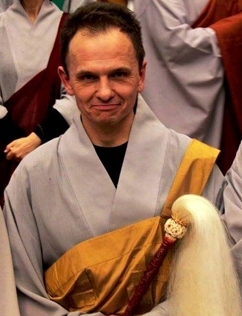 He has trained extensively at the Warsaw Zen Center, Wu Bong Sah, the School’s head temple for Poland. After fourteen years of practice, he received Inka on March 5, 2000 from Zen Master Wu Bong. and Dharma Transmission on March 19, 2016 from Zen Master Dae Kwang. Joeng Hye SSN works as a physical therapist in consultation with practitioners of complementary medicine. Joeng Hye SSN: Transmission Speech, 19 Mar 2016 at Wu Bong Sa, Poland.